Pictured above: ARC Specialties Inc., of Houston, Texas, recently donated a robot welding system to ICC. 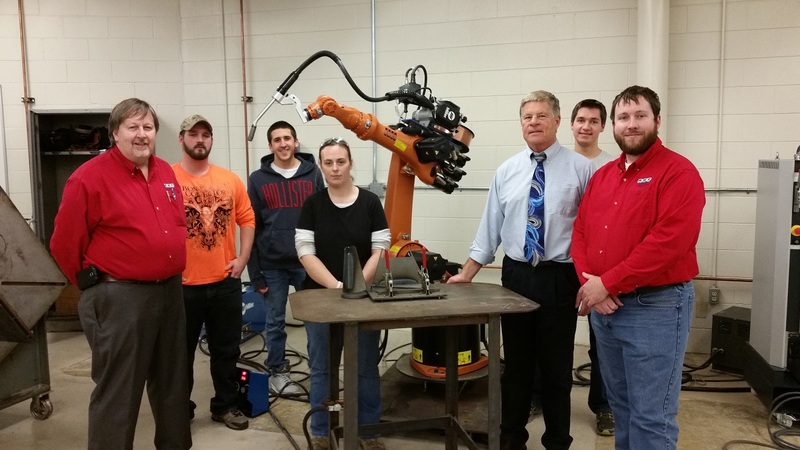 Pictured with the robot, from left to right are: Richard Holdren of ARC Specialties; students Jordan Pherigo, Michael Herkert, and Angie Johnson: Professor Rick Polanin, student Nathaniel Kaiser, and Jim Walker of ARC Specialties. ARC Specialties Inc., of Houston, Texas, an automation integration company for the oil and manufacturing industries, recently donated a robot welding system to the Manufacturing Engineering Technology and Welding Technology Programs at Illinois Central College. The robot is integrated with a Miller Electric welding power source and will give students experience in robot systems, automated welding and systems integration. ICC’s relationship with ARC Specialties was forged when company president Dan Allford addressed a joint meeting between the American Welding Society and Professor and Program Chair Rick Polanin’s manufacturing technology and welding technology classes in 2014. To help assure students attending ICC gain experience using advanced technology equipment, ARC Specialties worked closely with ICC faculty to develop operation and programming techniques. The Kuka robot welding system will be used in the Manufacturing Engineering Technology and Welding Technology programs to development student expertise in robot systems, automated welding, and systems integration. To learn more about ICC’s Manufacturing Engineering Technology and Welding Technology Programs, visit icc.edu/academics/catalog/agricultural-and-industrial-technologies/welding-technology/ or call Dr. Rick Polanin at (309) 694-5404.